As with the previous model, the rear end is tapered like that of a yacht. The long luggage compartment lid terminates in a pronounced, curved lip from which an integrated spoiler extends automatically at 120 km/h (74.6 mph). A flat light strip - a design feature common to all of Audi’s top models - joins the rear lights, whose tail lights are made up of 13 vertical segments. When the doors are unlocked and again when they are locked, fast-moving light animations play in the rear lights and in the headlights, highlighting the big coupe’s dynamics while standing still. The progressive exterior design of the new Audi A7 Sportback is largely devoid of chrome. The paint range offers a choice of 15 colors, eight of which are new. The optional S line exterior package further hones the look, with modifications to the radiator grille and the front air inlets, the sills and the front and rear diffusers. They are trimmed in gloss black and more strongly sculpted. The new A7 further extends its synthesis of sportiness and comfort. The optional dynamic-all-wheel steering, the new electronic chassis program (ECP) - the central controller for the chassis - and the updated air suspension make it even more agile, nimble and comfortable. The A7 is thus the perfect Gran Turismo: dynamic and agile on twisty country roads, yet comfortable on long highway stretches. Many aspects of the front and rear axles have been developed from scratch. The standard progressive steering, whose generally sporty ratio becomes even more direct the further the steering wheel is turned, features a new concept for intensive road feedback. Mounted behind large wheels - up to 21 inches and 255/35 - with improved rolling comfort are aluminum fixed-caliper brakes with discs up to 400 millimeters (15.7 in) in diameter. Customers can choose between four suspension setups: a conventional steel spring suspension, the sport suspension that lowers ride height by 10 millimeters (0.4 in), electronically controlled damping and the self-leveling adaptive air suspension. The A7 Sportback combines the best of all worlds and is a dynamic all-around talent for business and recreation. It offers the design of a Coupé, the spaciousness of a Sedan and the variability of an Avant. The interior concept of the A7 Sportback impresses with more space and more comfortable seating - and that despite having a dynamic roofline. Compared with the previous model, interior length has increased 21 millimeters (0.8 in), resulting in more rear knee room. Rear passengers also enjoy more head room. The loading width has also increased compared with the previous model and now measures 1,050 millimeters (3.4 ft). The body, which features steel and aluminum composite construction with large components such as add-on parts made of aluminum, is a key factor in the improved handling and greater comfort. 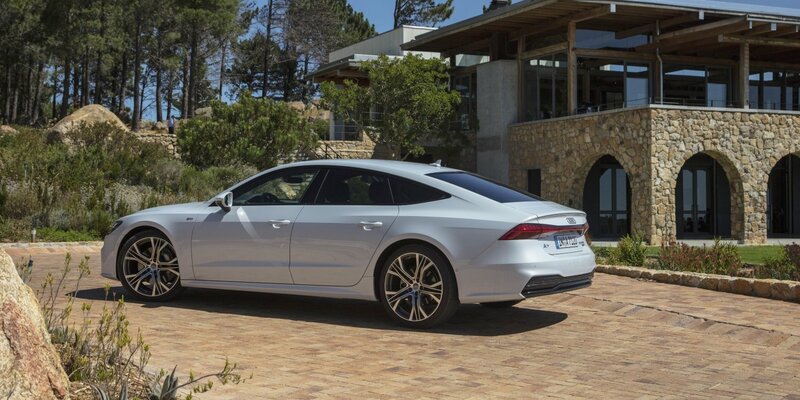 The four-door coupe scores top marks with respect to body stiffness, aeroacoustics and aerodynamics. The Gran Turismo spoils its passengers with improved acoustic comfort and - thanks to sophisticated aerodynamics - minimal wind noise. Despite the markedly dynamic lines, the luggage compartment has a base capacity of 535 liters (18.9 cu ft). This increases to 1,390 liters (49.1 cu ft) with the rear seats folded down. The luggage compartment has been optimized so that two golf bags now fit horizontally - in addition to the optional spare tire. The optional sensor-controlled rear hatch opens and closes automatically in response to a foot motion.